With July 4th here, millions of Americans are going to be doing 2 things; drinking beer, and grilling.Â Instructables has created a really cool guide for the gaming grillers out there. What do you get when you cross a love of Mario Bros, and a hamburger cooked on your grill? The 1UP Mushroom burger. The burger itself is actually vegetarian made with portabella mushrooms. However, for the carnivores out there, meat is an obvious substitute. 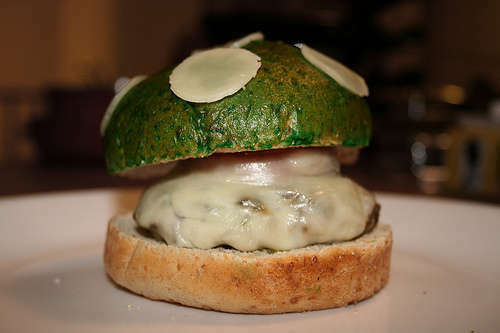 The top of the bun is dipped in a green food coloring mixture, and is topped with mozzarella cheese circles to complete the mushroom look. The insides of the burgers are draped with a big piece of mozzarella cheese that gives the effect of the mushroom stem. If you’re looking for other ways to impress your friends with your Mario fandom, check out the 1up mushroom for your desk.